EMTAC Navigator PalmOS Bundle, now at version 3.0, is a full featured GPS Navigation system for Bluetooth enabled Palm OS handheld device or PDA. 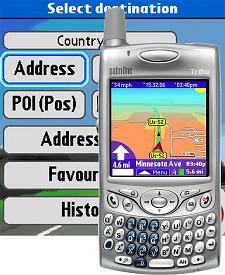 The EMTAC Navigator version 3.0 Palm OS Bundle comes with a SiRFstarIII BTGPS Bluetooth GPS receiver. The EMTAC Navigator GPS navigation software features voice turn-by-turn directions, voice routing, automatic re-routing, up-to-date maps based on NAVTECH/NAVTEQ precision map database, full Point-of-Interest database, map loading by state, fullscreen and landscape mode support (available on Palm Tungsten T3, T5, and T|X). EMTAC Navigator Palm OS Bundle is compatible with Palm Treo 700p, Treo 650, Tungsten T5, PalmOne T|X, Palm Tungsten T, T2, T3, T5, Zire 72, Treo 650, and Sony Clie NZ90 or TG50. treocentral reviews EMTAC Navigator version 3.0 Palm OS Bundle and concludes with overall rating of 4 out of 5 that ability to load maps state-by-state and have all the maps come on one DVD is a huge plus. Routing to addresses and POI’s is a breeze, but the address book routing feature was, sadly, frustrating and almost useless. The EMTAC S3-BTGPS receiver with its SiRF Star III chipset is damn impressive. An AC adapter should be included in a package at this price, but the internal battery and the car charger should be more than sufficient for most people. Aside from the flakey address book integration and the lack of an AC adapter, the EMTAC Navigator PalmOS Bundle is another worthy GPS navigation option for PalmOS Treos. Its biggest letdown is some software flakiness. Its high point is the incredibly powerful and capable GPS receiver.